Who wants 6 different packs of gourmet bacon delivered to their door? Um, you do of course! Some dry cured bacon does not require refrigeration for up to 60 days, but we ask you to refrigerate them upon arrival until you are ready to gobble it up! It will last for up to 90 days in the fridge. To prolong the life of your bacon even more, you can store it in the freezer for up to 1 year! The flavors of the 6 packs of bacon may vary from what's in the photo, but rest assured all are delicious and you can fry them in your birthday suit, if you so desire, as the fluid free curing process doesn't have that annoying "water weight" that splatters and evaporates as you fry the bacon. Do you have a favorite flavor that you would like to have included? Let us know in the comment section of your order and we will do our best to include it in this bundle. This was a gift for my father. This was a gift for my father. He received the product on time and got a huge kick out of a gift of bacon, his favorite, in 6 varieties on his doorstep. 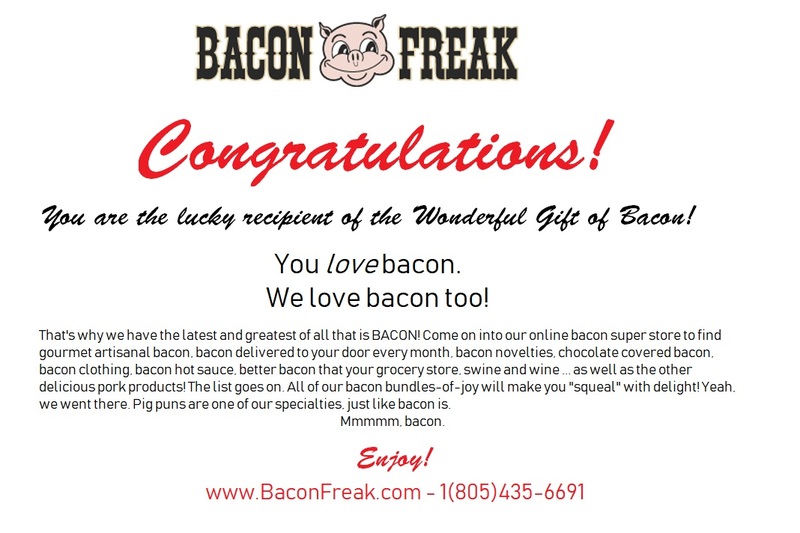 Best gift in the world for any bacon freak! Just wanted to let you know that my son received his birthday gift and LOVED it! He is on the Paleo diet and eats quite a bit of bacon in vegetables. I was able to go online and place the order and he received it in 3 days! Wonderful service and looking forward to his experiences in eating it!